Hot stamping, also known as, foil stamping is used to apply graphics to a surface with a heated die and foil. The process of hot stamping involves mounting and heating a die(s), positioning of a foil above material that is to be imprinted and lastly, a combination of heat and pressure. This dry printing method is environmentally friendly as it does not use solvents, inks or create any harmful vapors. 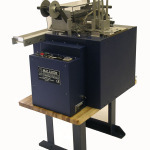 The hot stamping machines that are custom built by Spartanics are far from traditional. 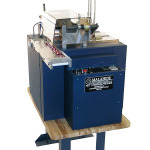 The Spartanics M-590 Hot Stamping Machine is the only one in the industry that optimizes a rotating motion of the die that allows for precise graphic placement. 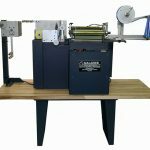 The Spartanics Hot Stamping Machine can also perform multiple stamps simultaneously and place stamps on web, roll and sheet material to within +/- 0.1mm accuracy across a web or sheet of material.